In the world of PPC, remarketing is undeniably one of the most crucial tactics that form part of your overall performance marketing strategy. Remarketing is a type of behavioral targeting that allows advertisers to target display adverts to audiences who have previously visited a website, regardless of their original traffic source. It works by placing cookies on a user’s browser. 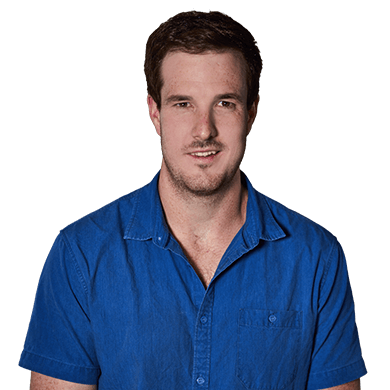 This allows the advertiser to trace that audience member across the other websites they visit and serve them display ads across those websites. It’s one of the best ways in marketing to match the right people with the right message. Knowing that a user has interacted in some way or another with your site, means that they are far more likely to convert, which puts the performance of remarketing on a similar level when compared to paid search. So, with all that said, where should one start when it comes to remarketing? The answer is remarketing lists. These are lists of cookies that represent a set of users who are chosen based on your targeting criteria. There are two common options for approaching remarketing – AdWords and/or Google Analytics. 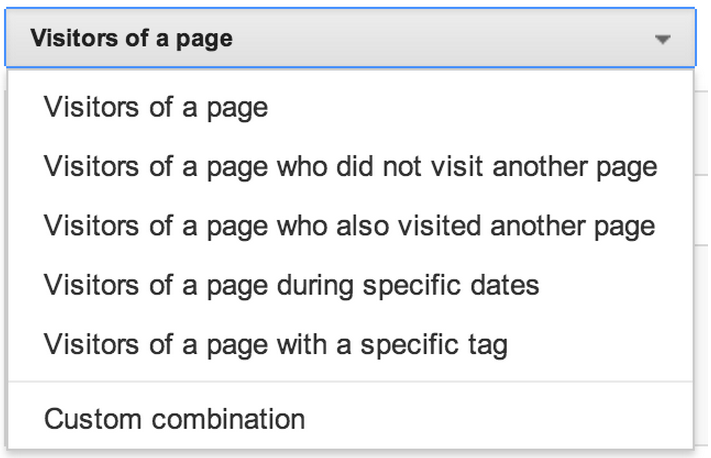 One of the first steps in creating remarketing lists is to determine which users to target and which to exclude, using the AdWords outline of “Visitors of a page”. These are the most basic forms of remarketing lists but a great place to start when setting up remarketing campaigns for the first time. These choices will allow you to include those who’ve visited your site, exclude those who have already completed a specific goal and build lists around users showing specific behaviour. This could be someone who has added an item to their shopping basket yet failed to complete the order. You could remarket to these users with an ad that offers them a discount code or maybe free delivery to entice them back. This is the most common template and is set as the default option when you create remarketing lists. You can use it to create lists of people who have visited a certain page or group of pages. Use this if you’d like to reach people who have visited a certain page of your site but have not visited another. This could be used for creating a list for shopping basket abandons; people who have added items to their basket but for some reason did not check out. Here you would be able to serve them ads with a discount code or free delivery, increasing the chances of them completing their purchase. This is used for creating lists of visitors who came to your site before, after or in-between specific dates. This can be great during the Christmas period when e-commerce sites normally see a big increase in traffic. The users that visit the site over this period can be remarketed to during the New Year. Membership duration is how long a visitor’s cookie stays on your list. We recommend choosing a duration related to the length of time that you expect your ad to be relevant for the visitor. In general, the membership duration should be similar to the length of your sales cycle. To gain a greater understanding of your sales cycle, go to the ‘time lag’ report under the ‘multi-channel funnels’ section of your analytics account. GA remarketing is undoubtedly more advanced than AdWords remarketing and should only be used once you have a firm grasp of standard remarketing tactics. What I love about GA remarketing is the near-infinite amount of audience lists that can be created. Unlike AdWords you’re not just limited to URLs, you can expand into some pretty amazing audiences, allowing you to get very creative. This section is pretty self-explanatory. Here you have all the demographic options that you need: age, gender, language and location. This is obviously essential for making sure you are only serving ads to your target demographic and not wasting spend. Under the behavioural targeting section, you can choose to target users based on the number of times they have been on your site, how recent their visit was, the number of transactions they made or finally the length of their visit. 1) Users who have visited my site at least twice, meaning they are clearly interested in what we are selling. Below is the conversion rate of multi-session users vs all users. As you can see there is a strong correlation between conversion rate and the number of times someone has visited your site. 2) Their last visit has been more than 5 days, meaning they could still be shopping around but have potentially forgotten about me or could have been distracted by a competitor. 3) Excluding people that have already purchased. 4) My 4th and final setting is looking at users that have spent 4 minutes on site which is based on looking at data from my converting users segment. 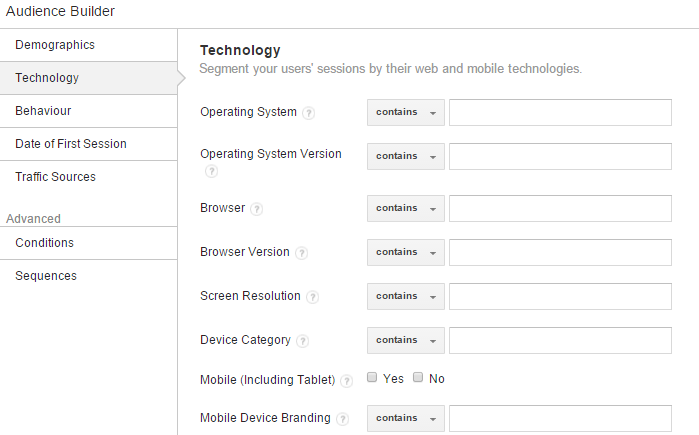 I suggest segmenting by converted users and analysing their behaviour in the ‘Audience Overview’ tab in GA. 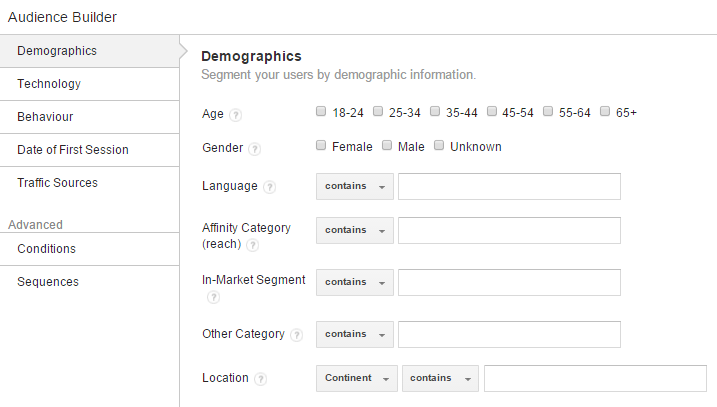 This will give a good start to how you should be segmenting audience lists. There are a number of different technology targeting options to choose. You might see in Analytics that your remarketing campaigns are converting above average on iPads or maybe certain desktop browsers. Here you could create a separate campaign solely focusing either one of these and increase your bids accordingly. Here we can segment users by their transactions and the revenue that these transactions bring in. You might want to create a segment of users who have brought products that are way over the average order value as they could be interested in certain offers that would only apply to these higher revenue threshold audiences. There are clearly many different remarketing strategies that can be used to complement your work being done in digital marketing. If you are currently not utilising remarketing, then start thinking about a strategy and begin building your audience lists right away. For more information about how remarketing can be used to complement your current digital strategy visit https://www.found.co.uk/retargeting/ to find out more.